I saw this photo of Obama’s speech and was inspired. I use that idea when I teach writing courses. I believe it applies any type of writing. Once people accept the premise, it frees the writer to do what is needed. To write something. Clearly Obama knows this. I’m glad to know that someone still uses a pen. And that the person “running the country” cares about what he says enough to make a mess. 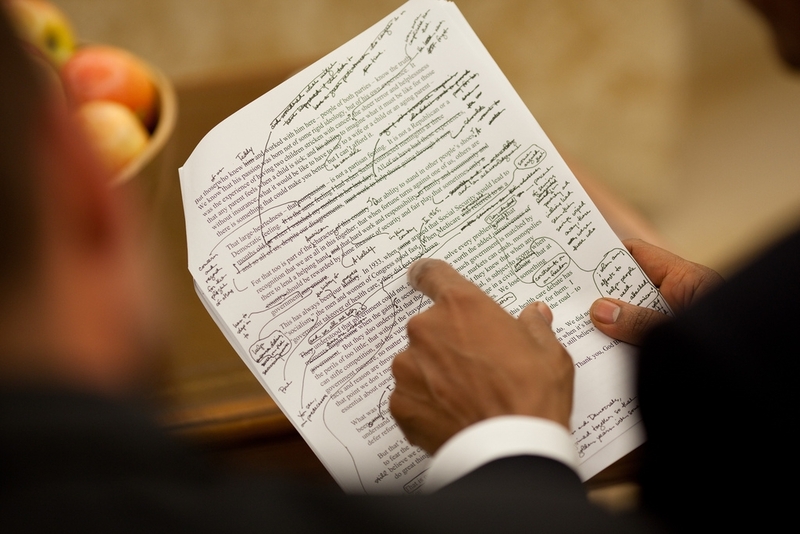 This entry was posted in Uncategorized and tagged academic writing, Barack Obama, making a mess, tactile nerdy things, words, writing. Bookmark the permalink. Oh, what freedom that offers! I know, I love the humility. Who knows if he knew the photo was being taken, but still. I love that ‘make a mess then clean it up’ notion. It’s a bit inspiring. Thanks, Billy. Not my own, but I love it too.